I guess everyone’s idea of normality is very different. When I was younger, being normal was all about hoping that my football team, QPR, would win a trophy. I wondered whether I would ever get my ideal job, have a partner and family. How little did I know that my idea of normality was to change so dramatically and would involve having a bowel transplant at 42. At the age of 12, I was diagnosed with an inflammatory bowel disease known as Crohn’s, which around 60,000 people in the UK suffer from. It is a chronic, incurable illness that causes inflammation, deep ulcers and scarring, mainly to the wall of the intestine, but it can affect anywhere from mouth to colon. The usual symptoms are abdominal pain, diarrhoea, lethargy and weight loss. My teenage years were ruled by how many times I went to the toilet each day (usually 10), whether the pains in my stomach and joints would ever go, and when I would be in hospital again. Treatment was through powerful daily drugs. I was unlucky. My Crohn’s was severe and the drugs failed to control the disease. The only treatment was to cut out sections of my inflamed intestine. I had 20 such operations and by 2010 was left with only 70cm of small intestine – the average person’s measures five metres. At that point I had intestinal failure. I was constantly sick, couldn’t absorb food or drink and could only be fed intravenously for 16 hours a day from a large bag. This had its own dangers – it is known to cause liver damage – and was therefore not a permanent solution. I wanted a normal life, without being wedded to a permanent artificial feeding regime and medications to control sickness and pain. It wasn’t just my family life that was affected. I had to stop work as the illness closed off most opportunities to maintain an income. But there was hope. I was told the only way to eat normally again and regain quality of life was to have a small bowel transplant. These are far from common operations. 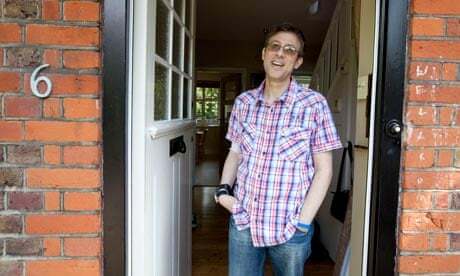 Only two UK hospitals have specialist adult bowel transplant units, including the Churchill Hospital in Oxford, where I was the 11th person to have the procedure. I was warned about the potential failure of the transplant. Because the immune system fights to rid your body of substances that appear to be foreign, such as your new bowel, and there are a large number of white blood cells within it, rejection is more likely than with other transplanted organs. The complex nature of the operation – hours in theatre, then a year to recover – was also stressed. Despite the risks it boiled down to one thing: did I want to wait until my liver started to fail and I might need a liver and bowel transplant, or should I go for the surgery now? My children needed their dad and I was desperate to get back to being the person my wife married, and for her not to become my full-time carer. From the moment my transplant surgeon said the five words that have stayed with me throughout – “I can change your life” – the decision was made. After a rigorous assessment last year, I was placed on the waiting list. I had been told that things would happen fairly quickly but I never expected it to be a month. When the call came, my wife and I sat in shock before heading to Oxford. I knew very little about the donor but couldn’t help wondering how that person’s family must have felt. Arriving at the hospital was the most nerve-racking experience of my life. The nature of the surgery meant that no one could predict the outcome; some patients have died, and even after getting through the operation there was a long road ahead. I was worried about how my wife would cope, and if the kids would be OK.
After the 10-hour surgery I remained in hospital for three months. My immune system was shot to pieces as a result of the drugs needed to stop the organ being rejected. I still had “mild acute rejection” and picked up numerous infections including shingles, but the care of my surgeon and transplant team was outstanding. I also had to have a stoma, known as an ileostomy, which is an opening where the end of the small intestine is brought to the surface of the skin and the output collected in a bag. Now, several months post-op, I am still connected to a liquid feed via a tube that goes directly into my bowel, but have recently started to eat normally in small amounts. The stoma will soon be reversed. I will always need to take anti-rejection medications and have my new bowel regularly monitored. Before the operation I began to chronicle my experiences, initially as a way of letting family and friends know what was going on. It has now had 50,000 visitors, with everyone from my transplant team using it to keep track of my progress as well as medical students who want to understand the procedure. Above all it has become a community for patients in a similar situation to discuss their own experiences. By sharing my unique journey, I hope it will make others feel that they are not alone. Michael Seres will be an Olympic torchbearer in Welwyn Garden City on 8 July.